New novelists, in their desire to create a descriptive novel, so often commit the sin of over-writing. That is, nearly every sentence contains a metaphor or unnecessary description which doesn't allow the reader to form his or her own mental picture. Such a writing style can impinge on the reader's patience, veering into annoying purple prose. However, in the case of 'The Quickening,' the story was so compelling, and the characters mostly well-drawn – though not always differentiated quite enough – I believe a little over-writing can be overlooked. 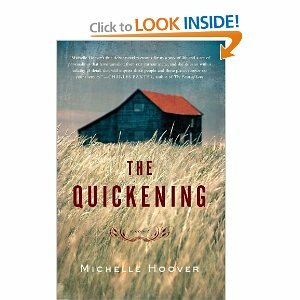 'The Quickening' tells the story of two farm families living in the Great Plains just after the Great Depression and during the beginning of the Dust Bowl era, alike only in that they're neighbors working the same crops and raising the same animals. In other ways they're totally different. For example, while "Eddie," the hulking farm wife, makes an excellent partner to her husband, sharing in the heavy labor without a word of complaint, her neighbor Mary is delicate, discontent, and strains against the virtual chains put on her, tying her to the land. While Eddie is content, Mary is restless, looking outside her marriage for comfort, playing music on the piano at the local church in order to keep some semblence of culture in her life. The two clash from the beginning. What forces them together is the fact they are neighbors, thus reliant upon each other's families in order to work the land and run their respective farms as smoothly as possible. Mary, lonely for friendship, finds in Eddie a consistent, though rough and uncivilized, companion to help her through her solitude. And Eddie, self-sufficient, though she dislikes Mary in many ways, at the same time relies on her to help look out for her family during emergencies. As for their husbands, while Eddie's Frank is gentle and the opposite of his wife in build, loves Eddie unconditionally. Mary's husband Jack, however, occasionally vents his anger on his wife, as well as on their children. Thus, we have two families thrust together against their wills, yet reliant on each other out of necessity. Survival depends upon good relations with neighbors when living in such a remote area, yet occasional clashes are inevitable. And it's these clashes that cause the tension of the novel, two families forced to rely on people they don't really like, yet must get along with. Aside from the occasionally over-wrought language, the plot and characters pull the novel along nicely. While it wasn't a novel I was dying to read, I didn't have trouble getting back into it after a break, either. I cared about the characters, but didn't feel true passion, and wasn't terribly emotionally invested in them. Still, a good read. Not great, but good. With more practice I believe Hoover is capable of producing a finer second novel. Lisa, the book group I attend at Read Between the Lynes in Woodstock will be discussing this book at our next meeting on Feb.21 if you’re interested. I haven’t started it yet but it doesn’t sound like my cup of tea. Suzanne, it is on the bleak side, that’s for sure. And I’m not able to give it a terribly high recommendation. Some compare Hoover to Willa Cather, which is utterly ridiculous. But I believe Hoover has promise. Thanks for info about the RBTL group. I’ll check my calendar. Previous Post Death Watch 2011!! The Morning After the Great Chicago Blizzard!